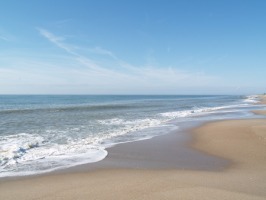 Relax in the Quiet Beach Community of Edisto Beach, South Carolina- Edisto Beach, South Carolina is the very definition of "peace and quiet," which is what many people are looking for in a vacation destination. If you are ready to take a break and head to your own little piece of serenity, reserve an Edisto Beach beach house before they are all booked for the season. Learn more here! Relax in the Quiet Beach Community of Edisto Beach, South Carolina- Edisto Beach, South Carolina is the very definition of "peace and quiet," which is what many people are looking for in a vacation destination. If you are ready to take a break and head to your own little piece of serenity, reserve an Edisto Beach beach house before they are all booked for the season. Edisto Beach is located on the southern tip of Edisto Island. It has a very small population, with the 2010 census showing only 414 people. This affluent area is only 45 minutes away from Charleston, so while your Edisto Beach beach house affords you a serene living space on the beach, you are never far from metropolitan attractions and nightlife. This makes Edisto Beach the ideal out-of-the-way vacation spot for both the beachcomber looking for relaxing days on the sand and the adventurer seeking new arts, leisure, and entertainment experiences around every corner. Edisto Beach is a family-oriented beach with a lot of shells, fossils, and shark teeth to find, as well as boating, kayaking, fishing, crabbing, and bird watching. You can bring your dog with you (but between May 1 and October 31 it must be leashed). It is not crowded here, and the picnic area and bathrooms make this very a convenient place to spend the day. Boat tours are a great way to explore the waterways around Edisto Beach; Botany Bay Ecotours can take you out to explore the rivers, marshes, and beaches of the area. This tour company features knowledgeable guides who explain wildlife ecology and natural resource management so you can learn how the South Carolina ecosystem works together. If you want to explore on your own, you can rent kayaks and paddleboards from Edisto Watersports and Tackle. They also offer fishing charters where you can try to catch blue fish, whiting, shark, sea bass, snapper, barracuda, amberjack, and snapper. If you are a shell collector, you will not want to miss a trip to Otter Island. You are likely to see bottle nosed dolphins on the 15-minute boat trips there and back, and on the deserted island you can find plenty of treasures to bring back to your Edisto Beach house rental, including sand dollars, whelks, shells, or even WWII artifacts, if you are very lucky. Edisto Beach has a few local attractions that really set this small town apart. King's Farm Market sells fresh, locally grown vegetables and fruit. They also have a kitchen that serves up freshly prepared key lime pie, crab and shrimp casserole, quiche, crab dip, and a lot more. The market is part of a farm that has been run by a family for six generations, so this destination is truly at the heart of Edisto Beach. Stop by for locally grown and prepared meal, and order extra to take back with you to your fridge in your beach house. South Carolina is known for world-class golf, and golf is a favorite pastime of Edisto Beach house renters and locals. The golf course on the island is the Plantation Course at Edisto. This course had a total renovation in 2006, so it features contemporary amenities that golfers love. It is not a long course, but it has a lot of water hazards that makes it challenging. You can rent golfing equipment here or bring your own. If your ideal retreat includes peaceful days on the beach, a small-town atmosphere, and a luxurious rental house that brings the feeling of home to your vacation, then Edisto Beach is for you. When you are ready to really get away from it all, your Edisto Beach beach house is waiting.